Ongoing insecurity in Unity State has forced thousands of people to flee into the bush, including 240 South Sudanese Medecins Sans Frontieres/Doctors Without Borders (MSF) staff based in Leer, South Sudan. A team of 30 local MSF staff have taken several dozen of the most severely ill patients from Leer Hospital with them into the bush, fearing for their safety. Other patients who were well enough to leave of their own accord also fled, and there are no longer any patients or staff left at Leer Hospital. Twelve MSF non-local staff were forced to evacuate Leer due to rapidly deteriorating security on 21 January. Although most of the town had fled, many locally-hired MSF staff chose to remain in Leer and continue providing life-saving medical care in the hospital, until security no longer allowed. MSF is extremely worried for the safety and wellbeing of our staff and patients. “In the last six weeks in South Sudan, MSF staff have worked in extreme conditions," says Jane-Ann McKenna, Director of Médecins Sans Frontières Ireland. "Our teams have operated in areas of active conflict, they have been forced to evacuate multiple times and our facilities have been looted. Since the beginning of the crisis, tens of thousands of people have been displaced from their homes in southern Unity State. This includes the more than 10,000 displaced from the fighting in Bentiu who had gathered in Leer and have now been displaced for a second time. The longer the population lives out in the open without adequate food, clean water or shelter, the more vulnerable they become to disease outbreaks and malnutrition. MSF has been working in Leer for the past 25 years, providing outpatient and inpatient care for children and adults, surgery, maternity, HIV/TB treatment, and intensive care. MSF is ready to return to Leer to provide medical care as soon as security allows. MSF calls on all parties to respect the integrity of medical facilities, to allow aid organisations to access affected communities, and to allow patients to receive medical treatment irrespective of their origin or ethnicity. 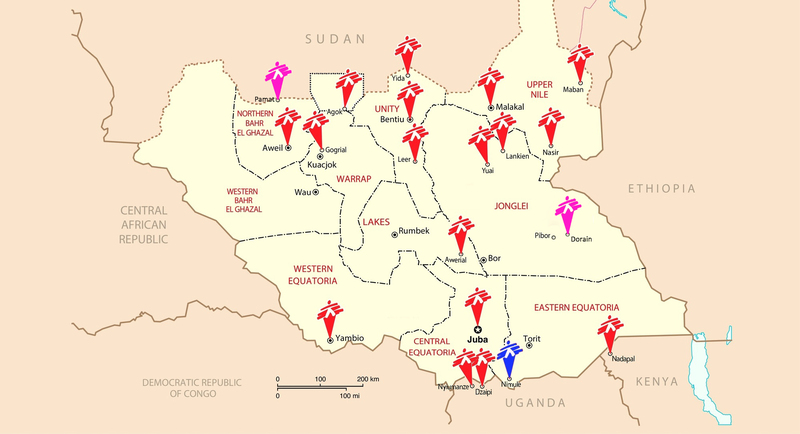 MSF has been working in the region that today constitutes the Republic of South Sudan since 1983, and currently runs 14 projects in nine of the country’s ten states, with regular projects in Agok, Aweil, Bentiu, Gogrial, Maban, Malakal, Nasir, Yambio, Lankien, Yuai and Yida and four additional emergency operations in Juba, Awerial, Malakal and Nimule. MSF responds to emergencies, including large-scale displacement, refugee influxes, alarming nutrition situations and peaks of disease such as measles , malaria, acute watery diarrhoea and kala azar, in addition to providing basic and specialist healthcare services. MSF is also providing medical and humanitarian to refugees from South Sudan in Kenya and Uganda, and will soon begin activities for refugees in Ethiopia. In the first five weeks of the crisis, MSF has carried out 71,973 consultations (including 27, 688 children under 5), 2,710 hospitalizations (including 1,600 children under 5), treated 1,252 war wounded, and 1,610 deliveries. MSF currently has 278 international staff working in its projects alongside 2,890 South Sudanese staff.